Google may not make the prettiest smartphones, and they may not run the best software, but there’s one thing the Pixel 3 lineup is great at — and that’s taking photos. Their cameras are rated some of the best in the industry. The Pixel 3 and Pixel 3 XL will give you great shots in almost any condition, but their low-light performance is where they really shine. The so-called Night Sight feature captures incredible images without the use of an LED flash. You’ve probably seen Night Sight demonstrated in Google ads before, but it really stands out when it’s used for comparison shots like the one above. For some reason, Google doesn’t call out the iPhone in big, bold letters. 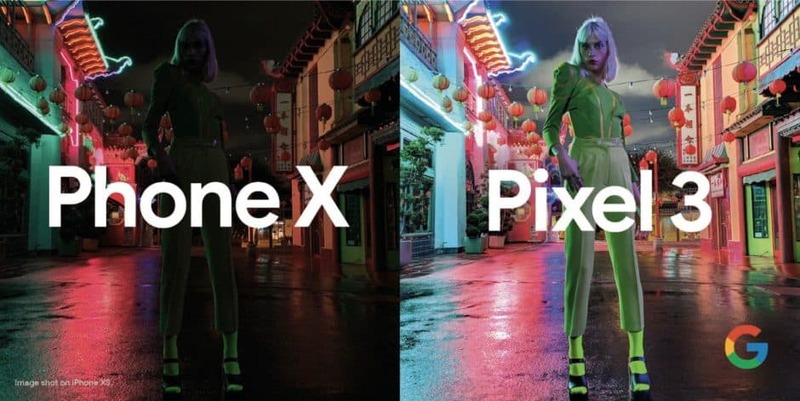 But if you look closely in the bottom corner of the comparison, you’ll see that an iPhone XS is “Phone X,” and the image it produces it nowhere near as good as the Pixel 3’s. You can clearly see the subject of the photo in the image taken by the Pixel 3, whereas their face is indistinguishable in the photo produced by the iPhone. The Pixel 3 also makes the colors in the background really pop. You might argue the Pixel 3 photo isn’t perfect. It does look a little washed out in some areas, but what’s most important is that it’s usable. With a little editing, it might look even better. Most of us wouldn’t even try to take a photo in these conditions using an iPhone. This isn’t the first time Google has shamed the iPhone XS to promote its Night Sight feature. It used a similar comparison during its I/O event last fall, when the Pixel 3 lineup was unveiled. At the time, we were skeptical the different would be quite so dramatic. Now that the Pixel 3 has been out for a while, however, fans and critics have had a chance to corroborate Google’s claims with stellar Night Sight photos of their own. It’s not yet clear what the latest comparison will be used for. It could appear in upcoming Pixel 3 ads, or on billboards and print advertisements. Whatever the case may be, this surely won’t be the last time we’ll see it.